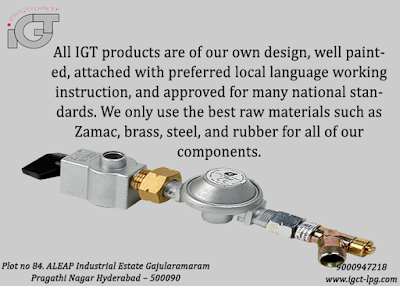 IGT (Integrated Gas Technologies) is a gas control equipment company excelling in manufacturing and marketing of LPG cylinder regulators, cylinder valves, and equipment accessories. Altogether the two founders have 40 years of solid experience in the global LPG regulator business. Our vision is to create Gas Technology that makes life better and safer for everyone, everywhere — every person, every family, and every community around the globe. This motivates us — inspires us — to do what we do. To make what we make. At IGT we "Strive for perfection" this motto summarizes how IGT is focused on bringing well designed, perfectly assembled professionally packaged products to the market. Before IGT entered the market in 2004 most markets had two offerings; either an expensive European made LPG regulator of good quality, with a minimum 5-year life cycle or alternatively a cheap “copy” LPG regulator of very poor and dangerous quality. IGT now serves the global market with the better of the two worlds by offering a significantly flexible product at a very attractive price. At IGT we "Strive for perfection" this motto summarizes how IGT is focused on bringing well designed, perfectly assembled professionally packaged products to the market. Our regulators are always 100% tested, clearly bar coded as well as safe and sound products, we will always strive to deliver freight and duty paid and on time no matter the location in the world. All IGT products are of our own design, well painted, attached with preferred local language working instruction, and approved for many national standards. We only use the best raw materials such as Zamac, brass, steel, and rubber for all of our components. Therefore we are not afraid to give all customers 5 years of warranty on all products. The warranty is backed up by a 2 million EURO product liability insurance, making IGT liable for its product quality during the full life of the product. Our unique product and service offer a combination of high quality, affordable products and a high degree of flexibility and responsiveness to your needs, all while we deliver the product in the right place at the right time without delays. It is this unique market positioning that differentiates IGT from all other competitive offers in the market today. What is an LPG (Propane) Gas, Regulator? Gas regulators automatically regulate high-pressure gas into a Maximum pre-determined limitation. The pressure in a gas jar can be 800-900kPa versus the 2.75kPa usually required. LPG gas labs are often factory pre-set to the typical working pressure for those appliances. What are LPG Gas Fittings? The gas fittings comprise all of the gas valves, valves, and valves necessary to construct a whole LPG gas system, linking the gas bottles into the appliances. Changeover valves decide from which gasoline jar the gasoline is being accepted. Licensed gas fitters are needed for all gasoline related work, Involving fittings and regulators, on houses and businesses. It turns back to a gas once you launch some of the strain from the gas jar by turning in your appliance. The pressure in a gas jar can be 800-900kPa. The glowing heat of sunlight and the quantity of gas remaining in the gas jar. Therefore, a regulator Must Decrease the pressure and Ensure a constant 2.75kPa is securely delivered from the gas jar for your appliances. Various applications may require unique kinds of regulators. The gasoline requirement of these appliances determines What Kind of Regulator is set up. For Instance, If the joint mega joule (MJ) evaluation of Your home's appliances is rather high, a regulator using a greater MJ score will be required. Commercial sized labs are completely distinct and often comprised of 2 individual units. The ruler is shown (appropriate) comes with an automatic changeover valve. Additionally, please notice that under no conditions should A BBQ regulator be used on a house installation. How can LPG Gas Regulators Function? Regulators have a diaphragm, and it can be a flexible rubber disk that reacts to stress changes and works to modulate the flow of gasoline into the appropriate pressure. If the port is blocked, the diaphragm won’t function properly. The port should stay free of debris and dirt to make sure that the Regulator works correctly. The gas bottles have been connected by a tube, called "pigtails “into some changeover valve along with the changeover valve is on the regulator. Pigtails can be made from solid aluminum, rubber or synthetic Metal above a rubber inside. Additionally, pigtails can trap or catch debris over time they should be replaced whenever that the regulator has been replaced. Pigtails are “elastic" and will absorb the shock of abrupt jarring or movement if the setup is accidentally bumped or moved from the place. Be rigid and much more vulnerable to leaks brought on by movement. The changeover valve controls that gasoline jar is currently in use when two petrol bottles have been set up. Changeover valves come in 2 forms, with Manual (revealed) and automated changeover versions. As the titles indicate, manual changeover valves demand Manual intervention while automatic changeover valves mechanically switch between gasoline bottles if the bottle runs dry. If You've Got a mobile gas heater, It'll Be connected to your house LPG supplied utilizing bayonet connections. Bayonet connectors could be wall or floor mounted. Your style is really unique in comparison to other folks I have read stuff from. Thank you for posting when you’ve got the opportunity, Guess I will just bookmark this web site.